Public Policy Polling acknowledges that there’s been a surge in support for the Democrats among likely voters, but it probably isn’t enough. One of the biggest hopes for Democrats heading toward election day has been that the party’s voters will get more engaged as the election comes closer, helping to mitigate its losses. A PPP analysis of 9 states where we’ve polled in October and also conducted a survey in August or September finds that the likely electorate for this fall is trending more Democratic- but not nearly to the extent the party needs. As Frye says in The Double Vision, “Hope springs eternal, it just tends to spring prematurely.” We’ll know soon enough. Meanwhile, Obama made an appearance on The Daily Show last night in the hope of drawing that all important youth vote to the polls. It was a good humored but still robust exchange. 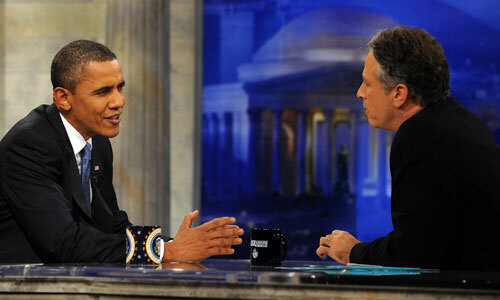 Jon Stewart pushed Obama hard on the disappointed expectations of the liberal base. But Obama pushed back and pointed out that much has been accomplished against long odds. Stewart and Colbert’s “Rally to Restore Sanity And/Or Fear” here. This entry was posted in Current Events on October 28, 2010 by Michael Happy. That’s the headline of a story in the New York Times today. Notice that the editors have no problem using the word “torture” when it is not committed by Americans. 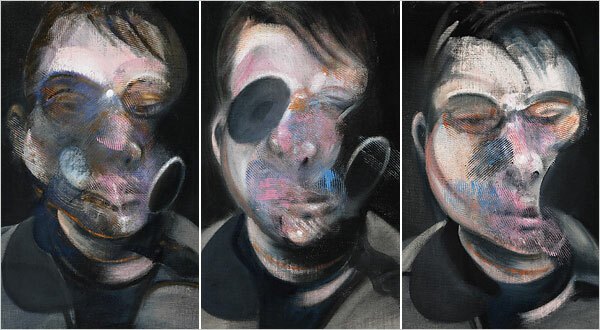 Today is painter Francis Bacon‘s birthday (1909-1992). This entry was posted in Anniversaries, Painting on October 28, 2010 by Michael Happy.